Chandigarh: The Global Sikh Council (GSC) has praised the Pakistan’s Prime Minister Imran Khan for his string of measures as part of Guru Nanak Ji’s 550th Parkash Gurpurab celebrations this year. Members of the Global Sikh Council (GSC) from across the Australia, Asia, Africa, Europe and the Americas appreciated Imran Khan for announcing plans to name the Baloki National Forest Reserve and a University in his country after Guru Nanak. “This is not only a great gesture of the Pakistan Prime Minister, Mr Imran Khan, towards the Sikhs, a tiny minority in his country, but a welcome acknowledgement of Sri Guru Nanak Sahib’s universal and eternal worldview and divine message to humanity. These announcements would surely strengthen close ties between the Muslims and the Sikhs,” the GSC said in a statement. “A Baba Guru Nanak University will certainly provide a conducive environment to Punjabi students from all over the world to get together and work in solidarity to prosper the region on both sides of the international border,” it added. “GSC President Gurpreet Singh thanked the Almighty ੴ – Allah Waheguru for inspiring Prime Minister Mr. Imran Khan, his government in Pakistan to take the historic initiatives”, written statement by GSC (copy available with SSN) reads. 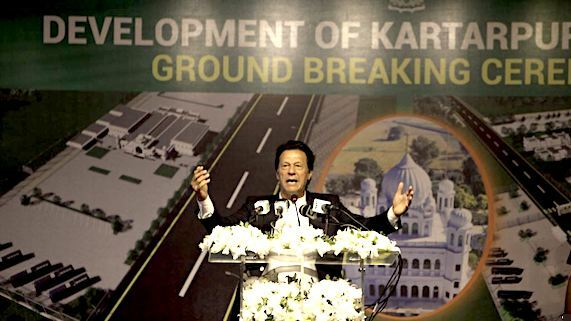 “PM Khan’s pro-minority gestures, including his government’s permission to allow the devotees of Guru Nanak visa-free access to Sri Kartarpur Sahib in Pakistan, are indeed noble gifts to the posterity,” the GSC President noted. “The Sikh community worldwide is highly indebted to the PM Imran Khan, his and the citizens of this historic step”. “Sri Kartarpur Sahib has a very special place in the hearts of devotees of Guru Nanak. It’s here that Guru Nanak Sahib spent the last over 18 years of his life, shared his vision with humanity all around. It is in Sri Kartarpur Sahib where Bhai Lehna Ji met Guru Nanak and was eventually installed as Guru Angad, the second Guru Nanak”, the GSC noted. “The government of India is also encouraged to reciprocate the gesture by extending access to the devotees of Guru Nanak across the border by opening a passage to Dera Baba Nanak and connecting the two sacred sites by road”, said Gurpreet Singh.